Annapolis, Md. – Nick Sloan split the uprights with a 30 yard field goal as time expired Saturday to give Navy a 24-21 victory over the visiting Pittsburgh Panthers. Sloan’s field goal ended a two-game skid for the Midshipmen and culminated a come from behind effort that saw Navy score twice in the final 4-minutes and get a huge defensive stop when they needed it most. QB Keenan Reynolds who ran Navy’s well-oiled offensive machine like a magician on Saturday, was the catalyst. Reynolds 31 yard run on a 3rd and 5 situation put the Mids in the red zone with 4:00 left. Reynolds encore was a 2-yard scamper that allowed Nick Sloan to tie the contest with his conversion kick. Then it was Navy’s defense that came up big. The Midshipmen defense bottled up Tom Savage, Pitt’s fine QB who had a 20-27, 203 yard day, on 3-straight plays to force a punt. 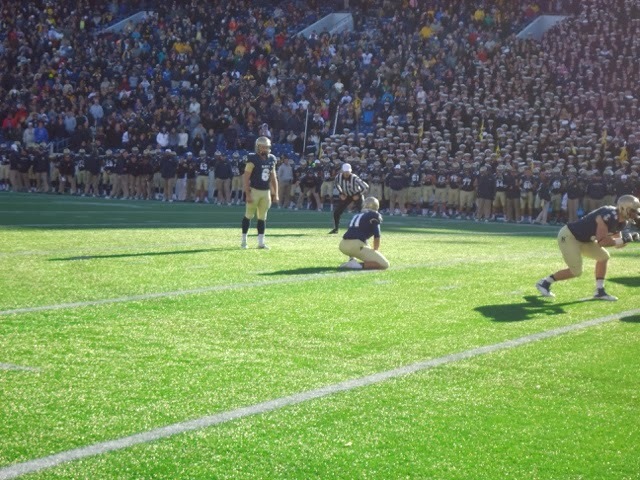 Matt Yoklic shanked a 20 yarder against the wind giving Navy great field position at the Pitt 49 yard line with 2:17 left. Two big third down conversions kept the Midshipmen moving toward field goal position as they mastered clock management and utilized all of their timeouts in getting three first downs to put them in position for Sloan’s game winner. Other than a big pass play from Reynolds to Thomas in the 2nd quarter, Navy’s offense struggled early. “We had problems with (Aaron) Donald and couldn’t block #44 (Shane Gordon) in the first half,” stated Navy Coach Ken Niumatalolo. “We just had to execute in the 2nd half and we did,” chimed in QB Keenan Reynolds. Senior Receiver Devin Street caught 9 passes for 96 yards and became Pitt’s all-time leading receiver during the game.